A surprising number of people answer that question by saying, “my microplane grater.” In fact, one of the people who gives that answer lives here in this house. I find this surprising, though, because as an Italo-centric cook, I grate only so many foodstuffs as part of my normal routine. But for my cooking cohort with Asian-fusion tendencies, the microplane grater was so life-changing that the quantities of finely chopped ginger we were accustomed to producing are now microplaned ginger, which shows up in everything from our iced-tea to guacamole. We are happy to report that technology has come a long way since grandma tended the stove. The way a pressure cooker works has not changed, but the engineering has been greatly improved. In brief, a pressure cooker’s job is to substantially reduce the time required to cook foods like pulses and tougher cuts of meat that would ordinarily take hours. The essential elements are liquid and pressure. 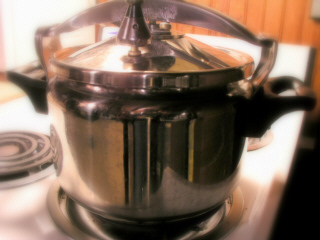 When heated, liquid inside the pressure cooker’s pot creates steam and a certain amount of pressure. Modern cookers are engineered to produce 15 Lbs. of pressure per square inch at sea level. When it reaches that point, a liquid boils at a higher temperature: 257 ° F. Any excess steam generated by the boiling liquid is vented through the pot’s lid. Food cooks more quickly. A typical “braise,” that might take 2-3 hours on the stove or in the oven is done in an hour or so. I got my pressure cooker at a hardware store in the south of France. While the town of Grasse is world-renowned for its large perfume-making operations, I remember it more for its hardware store than for the jasmine samples at Fragonard. The fact that European hardware stores often sell cooking utensils and that the French call a hardware store a droguerie, were enough to make me seek them out everywhere I went in Provence. My model was made by Moulinex, and in France anyway, is yet another of so many kitchen tools known simply as a mouli. Think of how Italians use the term machinetta to refer to any small machine from an espresso pot to a Fiat. If Labor Day marks the end of summer, it also heralds the beginning of the season of “bean cuisine,” in cooler climes. But because our air-conditioner is still kicking on for much of the afternoon, we were inspired to do a little experiment to see if we could keep our kitchen cool and save energy while still cooking our beans. 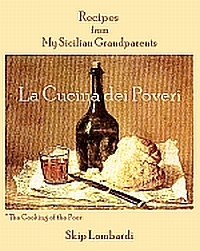 Ordinarily, Italians don’t soak beans overnight, but rather, cook them for 10 minutes at a full, rolling boil before moving on to the rest of a recipe. We asked ourselves what would happen if we gave the beans those first 10 minutes under pressure. Then, we went a step farther: we let them sit—sealed in the thick, heat-retentive pot and off the burner. After four hours, we opened the still-warm pressure cooker and found the beans were completely cooked. This was a great surprise. Not only were we saving energy, but we weren’t even heating the kitchen enough to trigger the air conditioning. And we had a supply of perfectly tender cannellini that would make at least two, and possibly three, meals. We’re not sure how long cooked beans will keep in the fridge. 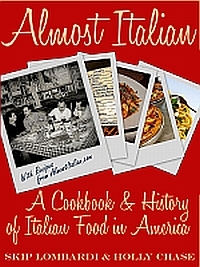 With our culinary styles (Italian, Middle Eastern, and Indian), we tend to use them up in a couple of days. At lunchtime, it’s a simple matter to chop a sweet Florida onion, open a can of tuna, and snip a few sprigs of rosemary for a satisfying Tuscan lunch. 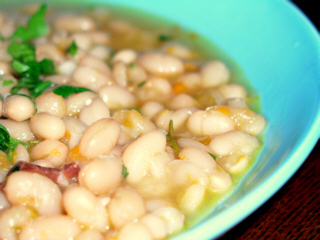 Bean soup is merely a batutto—chopped pancetta, carrot, celery, onion, garlic, and parsley quickly sautéed—added to a bowl of warmed beans. Today’s pressure cookers are sleek, efficient, and safe. And, for those of us with an interest in saving energy, they provide a great way to cook slow food fast. It goes without saying, though, that when we serve our zuppa di fagioli, we’ll garnish each bowl with a shower of Parmigiano from our microplane grater.